The Blue Feed, Red Feed tool relies on data from a large study of Facebook users conducted in 2015 by Bakshy, Messing, & Adamic (U-M Library access). 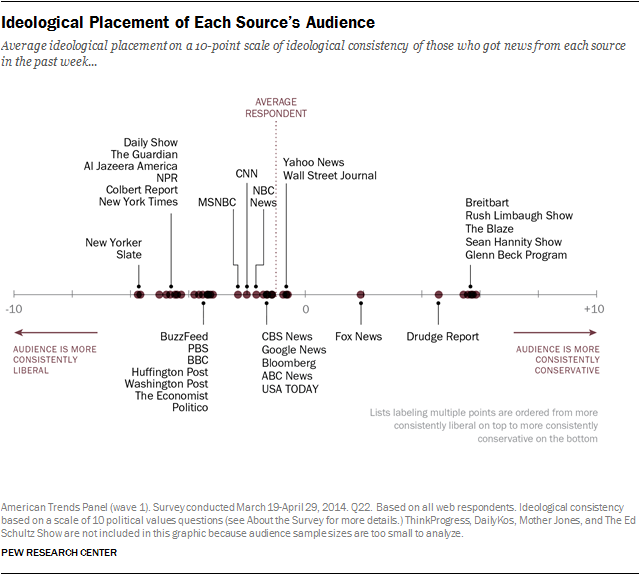 The ideological alignment of news sources on Facebook was measured based on the stated ideological affiliations of users who interacted with the content. Note that much of these ratings are based on surveys of personal perceptions. Consider that these may be impacted by the hostile media effect, wherein "partisans perceive media coverage as unfairly biased against their side" (source: Perloff, R. M. (2015). A three-decade retrospective on the hostile media effect. Mass Communication and Society, 18(6), 701-729. (U-M Library access)).